Welcome back to the Comic-Con picture blog, apparently! It's too bad for seekers of substance - I just have too many great pictures to show. Why not show them all at once and get it over with, or intersperse these picture posts with other items, you ask? Because...I don't know. That's a good point, honestly. Maybe the next one will be different. But not this one! Let's see some pictures! Up top is a statue from the Sideshow booth. It's of Dr. Doom and it is awesome! It's also going to cost somewhere in the neighborhood of $2000. Insane. There just wasn't a market for things like this 20, maybe even 10 years ago. This looks like just another booth at Comic-Con. It's SLG's booth, it seems. But what is unique about this is that they had a jam session like this one going on every time I walked by. Pretty neat. This booth had movie costumes and props. I'm not sure if they were authentic, but they were cool! In the foreground we have items from the X-Men movie, and in the back there's a Christopher Reeve-era Superman costume. Behind the Magneto costume was a really cool Ghost Rider motorcycle. It's too bad the Ghost Rider movie was so hideous. After the show on Sunday, I saw some people wheeling it out the back. I assume they weren't stealing it. Every comic convention needs an appearance by Lou Ferrigno, and this one is no exception. Ugh, I LOVED this parody. I saw a few bags like this. I don't know if I'd have the guts to carry something like this around, but wow! How biting. Outside of the convention was a restaurant that Sega, of all companies, rented out. Doesn't Sega just license out its characters, now? That's how Mario and Sonic can have their duo racing games, right? Whatever. We missed out on playing free games two nights in a row because we had to close up our booth. But I got some pictures from it, and this full-scale Alien prop made for a good one. Sonic and I had a difference of opinion. This was one of the first good costumes I saw at the show. I thought it was Johnny Quick from the Crime Syndicate at first (you know, this guy), but then I realized that it was just his lanyard. Here's a dedicated fellow. He's got the physique for the Silver Surfer as well. I thought he looked great, though it would have been ultra dedication if he had an actual surfboard. It would have been horrible to carry around, though, so I don't blame him. These were good costumes. I can't say I expected to see these at Comic-Con, but good work is good work. OH YEAH THE THING!! Even though the "4" was taped to his shirt, this costume holds a special place in my heart. Nice choice, big guy. 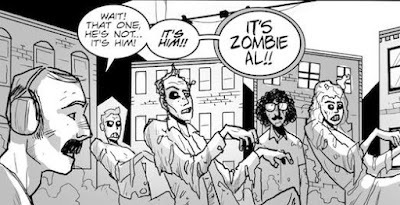 A zombie reading a book about zombies. Perhaps this is FUBAR's target audience. For the level of sophistication involved in making it, there certainly seem to be Iron Man costumes at pretty much every convention I go to. I've never seen a Maria Hill costume before, though, and I'm sure we have the movie to thank for this one. It's hard to make a SHIELD costume took good at a convention, but this one looks great. Speaking of great costumes, check these out! Batman in particular looks amazing. I'm assuming that this is a Miss America costume and not just a girl Captain America. We'll stop with this picture of the Hypnotoad (all glory to the Hypnotoad) from Futurama. This guy was limited to 500 pieces and sold for $40 at the show. And it sold out on preview night! That means those who didn't buy a four-day pass (with the fifth included) weren't given any chance to buy this. I didn't even get one - I went over on Thursday morning to find that it was already gone. This is a shame, because it's one of the only things I wanted to get for myself. Now they're going for nearly $100 on eBay, and because if this I was feeling pretty bummed. A few days ago, though, someone told me that these were in Diamond's Previews catalogue and can be ordered for October...for $40. So...hooray! It looks like I'll be getting one after all. I've been surprisingly stingy about sharing pictures from Comic-Con. Who can say why this is happening? Perhaps only the Shadow knows. But here I am again, with more pictures and stories to share. This batch comes from the Tuesday before the show started - set-up night! I was excited as I walked down the aisles to find my booth, because I realized that I was seeing everything before almost anyone else got a chance to. I took these pictures and thought about posting them right away, as if I were a reporter with a scoop, but then I started to wonder about any litigious repercussions that might come from spoiling the secrets that any of the booths might have held, and I decided against it. Who knows if I was being overly cautious or not. Perhaps only the Shadow...wait, I used that joke already. Oh well, time for pictures. Hooray! Here's the booth, all barren and lonely, like a dry gulch before the Gold Rush. The exhibit all is so huge that you have to strain to see from one end to the other. And you rarely see a Comic-Con hallway that's not teeming with people. Sideshow had most of their display set up by the time we got there, though many things were covered. They had, and always seem to have, some of the most impressive items at any con. Here's Oni Press's booth as they get things ready! Marvel's booth seemed to be under construction right up until the minute the show opened. Overheard at Boom! Studios: "Well, we got that damned banner to hang from the ceiling. ...Let's pick it up tomorrow." The unreachable inner square of Image Comics. An early look at Castle Greyskull. We were all very excited. The Walking Dead display before Michonne and her two zombies were installed. These guys went to bed early, apparently. These pictures don't show it well, but there were a surprising amount of people outside of the convention center even though the show didn't start for another 22 hours or so. I don't think that all of them were fellow exhibitors - some people just wanted to soak in the Comic-Con atmosphere a little bit early, and I can't blame them for feeling that way. I wonder how long it was before someone eventually stole this prop (it was originally sticking out of the bushes). And I wonder how that person got it home...because you certainly couldn't check it as luggage, could you? HGTV and the Frankenweenie movie combined forces on an outdoor display. What fun! It was hard not to be at least a little bit giddy from getting this little taste of Comic-Con on Tuesday night. Wednesday was a lot more stressful. But I'll save that for next time. Well, Comic-Con has come and gone for 2012. I don't hesitate in saying that it was the best convention that I've ever been to, and this is for multiple reasons. But for now, as I'm waiting to fly home from the San Francisco International airport, pictures will have to suffice. And oh! The pictures. It's going to be a challenge to not have this blog just become a Comic-Con pictures blog for the next month - between me, my wife and Larry, we probably took 600 pictures and most of them are awesome. So if you don't see something you like in this batch (come on!! ), there'll be plenty more to show. Let's begin! This was the Iron Man 3 stage at the beginning of the show; on the weekend, Marvel revealed the new Iron Man movie armor. From the standpoint of sheer size (and cost! ), this was maybe the most impressive of all the displays. Here's part of the Dark Horse booth, featuring an image of Malcom Reynolds from the Firefly/Serenity series (perhaps you've heard of it?). Oh, Firefly. We had some adventures in line for this panel. The LEGO booth was impressive as always. I wonder whose job it is to build these things and just how much planning goes into it. My guess: a whole heck of a lot. The Knight Rider car was on display the entire show, and David Hasslehoff himself showed up on Saturday. Despite having the movie premier the weekend after, The Dark Knight didn't have a big presence at the show. This was one of the few things I saw that was related to it. Happy 30th birthday, He-Man! This was pretty impressive. I can't see myself buying a ticket or otherwise watching the Total Recall remake, but they had some really cool things at Comic-Con. Just wait. Look, it's the dumb new Superman costume! I wish that instead they would have built Stan's house. It's apparently the year for anniversaries. Here's the big (bigger than it seems from this picture) Cartoon Network mural. There's a lot of characters on display and it was fun to try and pick some out. The Foot Clan gets 20%?!? Who are these people voting for them? I didn't buy this Thing and I'm kind of disappointed (thought I can't imagine how I would have fit it in my suitcase on the flight home). Obviously, there were lots of things to buy and I did my share and then some. We'll end there for now, but there will be lots more to come. I had been to Comic-Con in 2006, but this one was even bigger. Stay tuned. I'm on my way to Comic-Con and am excited to get to San Diego and set up the booth! But before then comes the blog. Always the blog. Let's see what we've got. 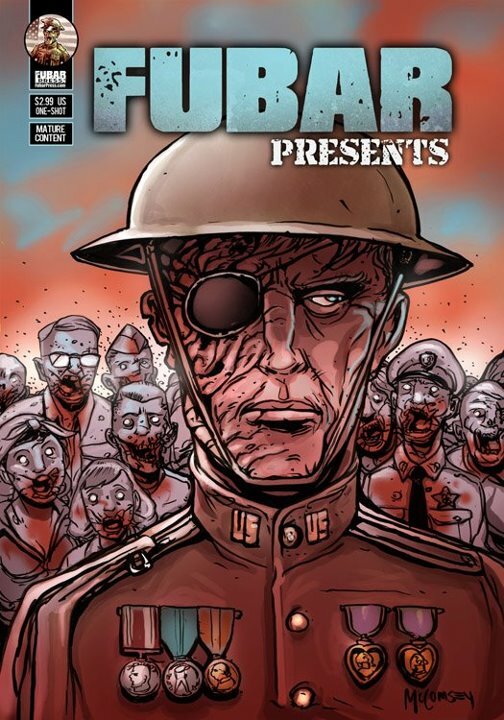 - The recent post about FUBAR's Comic-Con exclusive book has recently become one of the most popular I've written. I'm going to assume that this is because hundreds of people are interested in the limited edition book that I'll have at the booth, and not because they're all doing a Google Images search for the Comic-Con logo. A hem. The books are done and are racing me to San Diego...they should be in today or tomorrow! 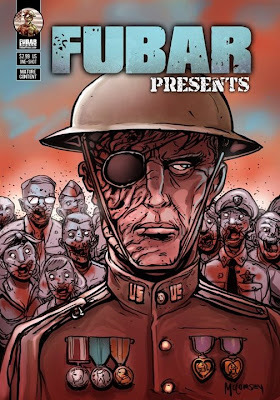 - After the Comic-Con issue, the next FUBAR to arrive is FUBAR: Summer Special, which is tentatively scheduled to arrive in stores on August 15th. Above is a clip from a story I have in that book, titled "To the Last Man". The art looks just fantastic, and it's by Lonny Chant, with greyscales by Jeff McComsey. - Paypal Here, the mobile credit card service, launched months and months ago. When I heard about it, I signed up for it right away! And then I waited...and waited. Last week, I got the approval e-mail, and on Friday, I got this thing in the mail. This was an extremely close call, but I'm happy that it's here and I'm happy to say that I'll be able to accept credit cards at the Wagon Wheel Comics booth! So the ol' "I don't have any cash on me!" convention excuse is no longer valid. - Your friend (and mine) Larry will be dressing up for Comic-Con this year. What costumes will we be wearing? I'm not giving up any secrets just yet, but they involve the helmets above. Look for a post I'll write about every website we show up on in costume in about a week and a half. - Take a peek at the new and improved Franks and Beans DVDs! And by "new and improved" I mean "I painted them." We'll have these guys at the booth on sale for cheap. What booth, you ask? Why, row Q, booth 11 in the small press section! Stop by and say hello! And if you buy a DVD, you might be our new best friend. Here's a new Franks and Beans! Enjoy!